The Hairy Woodpecker (Picoides villosus) on the bottom has a beak size that's a bit longer than the head behind it. The beak size of the Downy Woodpecker (Picoides pubescens) is only about one-half the head size. While there are several field characteristics that differentiate these two birds, the beak size is by far the easiest field mark to look for. Status and Distribution for North-central Texas - While Downy Woodpeckers are generally common throughout the study area, Hairy Woodpeckers have mostly disappeared from Dallas County westward. 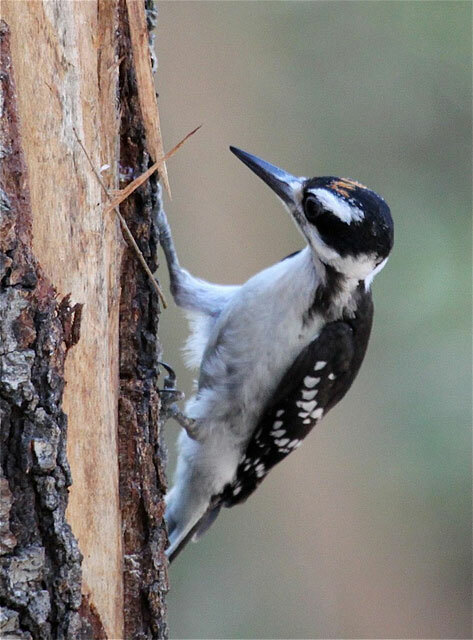 However, the Hairy Woodpecker is still fairly common to the north and east along the Red River, and in the far eastern counties of Fannin, Hunt, Rains, and Van Zandt counties. They become increasingly common in the piney woods of East Texas.